These images show crescent-shaped Lake Balkhash in eastern Kazakhstan, north of the Tien-Shan Mountains (bottom right).The Ili River flows into the western end of the lake, filling it with bright sediment. This sediment highlights the difference between the mostly freshwater western side of the lake and the more highly saline eastern side. A sandbar largely prevents mixing between the lake’s two sections. The lake is situated in a tectonic depression, and is highly variable in volume and surface area as a result of the continental climate--a climate that lacks a moderating influence of an ocean or large body of water, and therefore typically experiences seasonal extremes of climate. To the south is a large desert. 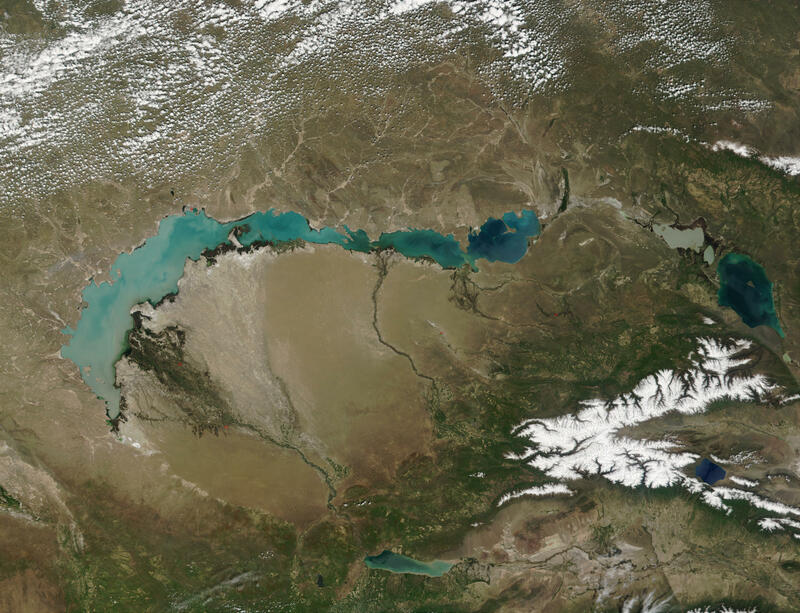 At the bottom of the image from April 13, right of center, a blue-green body of water shows the location of the Kapchagayskoye Reservoir, whose filling from the Ili River is having negative consequences on Lake Balkhash. These images were acquired by MODIS on selected dates between April and August 2002.